A lighthearted science fiction novel about first contact, exploration, and desperately trying not to screw up from an up-and-coming sci-fi author. On humanity's first extra-solar mission, the exploration vessel Magellan, or, as she prefers, "Maggie", discovers an alien artifact. Deciding that finding advanced alien life is too important to ignore, Captain Allison Ridgeway chooses to return to Earth while ordering her crew to reverse engineer technology far beyond anything back home. Meanwhile, at mission control, the governments struggle to maintain the existence of aliens a secret while also combating bureaucracy, the military industrial complex, and everyone else who wants a piece of the science that could skyrocket humanity into a new technological golden age. Little does everyone involved know that the bumbling of a few highly evolved apes in space hasn't gone unnoticed, and the people of Earth have put themselves on a collision course with a far wider and potentially hostile galaxy. While the book style is childish at best, the performance is making it even worse... Think Curious George in space. I enjoyed the stoy as a whole. The characters were interesting and entertaining. Lots of action, sci fi geekiness, and a dash of humor! awesome read! highly recommend! Tomlinson's Wit still Tickles Me! First contact scenarios are a common enough trope in science fiction, but Patrick S. Tomlinson manages to inject a bit of freshness and fun, and more than a few dashes of silliness, into mankind’s discovery of intelligent life out amongst the stars. Gate Crashers feels at times like an ode to Star Trek (Tomlinson’s Captain Ridgeway of the Magellan being only a hairsbreadth away from Voyager’s Janeway, while Bucephalus‘s Captain Tiberius, a dashing man of action in and out of the bedroom, draws an obvious parallel to one James Tiberius Kirk), replete with a few away missions for our band of cosmonauts that see them tangling with strange new worlds, new life, and new civilizations, boldly going where plenty of aliens have already been before. Despite there being a certain degree of familiarity baked in, Tomlinson still manages to do his own thing and brings in shiploads of fun along the way, playing a lot of Earth’s first expedition into deep space for laughs. The discovery of an alien artifact by the Magellan’s crew kicks off a wave of scientific advancement, as well as the emergence of an artifact worshiping cult, back on Earth. This latter development is particularly preposterous given the fairly mundane nature of the alien device, and this sense of grandiose discovery for mankind, of things that are commonplace for the galaxy’s alien races, becomes a significant theme that recurs throughout the book. There’s a fun bit of interplay between expectations of discovery and the reality of their situation, but Tomlinson injects plenty of high-stakes action, political machinations, tabloid sensationalism, and world-destroying perils along the way. The threats to mankind are deadly serious, and despite some scenes overloaded with attention-killing technobabble, the story floats along with a good degree of jubilation. Not every joke landed just right for me, but I found myself laughing along with Tomlinson’s wit more often than not. One pun about being a “seasoned veteran” still tickles me, in fact, well after having finished my listen of Gate Crashers. While the writing is bent toward the comedic, Alyssa Bresnahan’s narration is, unfortunately, largely straight-forward. While she does an admirable job bringing the various characters to life, injecting each member of the Magellan and Bucephalus with their own distinct quirks and voices, her reading is oftentimes much too serious given the tone of the material. 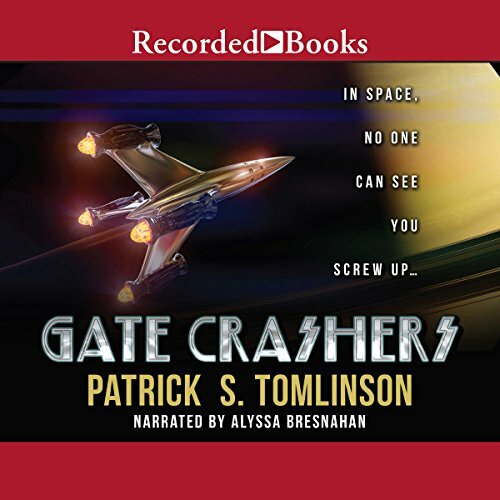 Quite a few times, I found myself wondering how Gate Crashers would have sounded with a narrator like Wil Wheaton at the helm, who could capture the irreverence of this particular story and Tomlinson’s writing, much as he had for several of John Scalzi’s audiobooks. Bresnahan’s narration is perfectly adept during this book’s more serious moments, and I’d like to listen to her reading a work that isn’t so reliant on humor, but she too often misses the author’s comedic beats and plays too much of a straight man to Tomlinson’s silliness. On the production end of thing, Bresnahan’s reading comes through crystal clear and Gate Crashers is another finely recorded audiobook from Recorded Books. I have bought all of Patrick S. Tomlinson's audiobooks, for the general fun of his foolery and the unusual charm of his characters. As an unexpected bonus with Gate Crashers, I also discovered a new favorite narrator. I thought Alyssa Bresnahan brilliantly captured the quick rhythm and highly elusive subtleties of the writing here. She made the wildly distinctive cast of characters and their extremely witty dialogue come vividly alive for me. I see experiences here differ greatly. But I found this particular partnership of reader and writer a perfect match, and deeply enjoyable from beginning to end. I liked the characters. I liked the world building. Some interesting plot twists and I liked the dry humor. Overall 4 stars. This isn’t a shootem up space opera. It’s more of a thinkers space journey. The ending wraps up nicely but leaves room for a sequel. This was a nice change from lasers and running space battles through the galaxy. There is a little bit of that but it’s used sparingly. This might not be everyone’s cup of tea but I liked it and will be watching for a sequel. Nicely done.